Since the 2010 publication in this journal of a review of the management of imported malaria for UK children, new evidence for the treatment of both severe and uncomplicated malaria has been published. This review discusses these new data and expands the scope of the previous review to include non-endemic countries outside of the UK. The results of the AQUAMAT trial in late 2010 and other studies have prompted the WHO to recommend that intravenous artesunate be used preferentially over quinine for the treatment of severe malaria caused by any Plasmodium species in both adults and children. Oral artemisinin-based combination therapies have also shown equivalent (if not better) efficacy in the treatment of uncomplicated malaria caused by all Plasmodium species (including chloroquine-resistant P vivax) in both adults and children, though there are issues regarding the availability of artemisinin-based combination therapies in many non-endemic countries. In these instances, conventional therapeutic regimens continue to be efficacious. Lastly, the use of primaquine for hypnozoite and gametocyte eradication is discussed. In the UK from 2005 to 2010, there were approximately 1600 cases of imported malaria each year, of which 10–15% of cases were in children.9 ,10 Of childhood cases, 90% were among African children who acquired their infection in Africa as VFRs. Most cases (∼80%) were falciparum malaria.9 ,10 The USA has a similar epidemiology—approximately 1500 cases annually, of which 15–20% are children and 70% are among VFRs.8 In Australia, the age profile is similar, but the number of cases of imported malaria halved from 800 in 2005 to 400 in 2011,11 in part due to improved pre-departure screening and management of malaria in humanitarian refugees. An overview of the clinical presentation, diagnosis and management of imported malaria in children in the UK was recently published in this journal.10 Here we have updated the information on treatment of malaria in children, following the publication of key new evidence. Refer to figure 1 for the definitions of severe and uncomplicated malaria. More recent research using parenteral artesunate has shown it to be rapidly and reliably distributed,14 ,15 and highly efficacious for the treatment of severe malaria due to all Plasmodium species. The 2005 SEAQUAMAT study, a large well-designed study of 1461 Southeast Asian patients (including 202 children) with severe falciparum malaria, directly compared mortality outcomes in those treated with intravenous artesunate versus quinine.16 The trial was stopped prematurely due to the clear survival advantage of artesunate in adults (relative risk (RR), 0.69; 95% CI 0.54 to 0.83; risk reduction 34.7%). However the study was relatively underpowered for these findings to be generalised to the paediatric population. The first WHO Guidelines for the Treatment of Malaria (2006) recommended either parenteral artesunate or quinine as acceptable therapies for severe falciparum malaria in both adults and children.13 SEAQUAMAT, AQUAMAT and other similar clinical trials (recently summarised in a Cochrane review18) have led to a change in the WHO guidelines such that intravenous artesunate be used preferentially over quinine as the drug of choice in both adults and children with severe falciparum malaria13 (figure 1 and table 2). There are no studies that directly compare the efficacy of intravenous artesunate to quinine for severe malaria caused by non-falciparum species.3 ,4 However, artemisinins have demonstrated higher activity against P vivax than P falciparum, and faster parasitic clearance times against P vivax than chloroquine or quinine.23 The clinical success of artesunate has been also well-documented in multiple case-series of severe vivax3 ,4 and knowlesi6 malaria in both children and adults. Given this evidence and its proven superiority in falciparum malaria, parenteral artesunate is now recommended as the first-line treatment for all cases of severe malaria regardless of the causative species.13 Furthermore, intravenous artesunate should also be used whenever oral therapy is not tolerated (figure 1 and table 2). The accessibility of intravenous artesunate in both resource-rich and resource-poor countries has been an issue, but the situation is improving. It remains unlicensed for the treatment of severe falciparum malaria in the UK, European Union, USA and Australia because the only commercially available product (Guilin Pharmaceutical Company, China) is not manufactured according to international Good Manufacturing Practice standards. However, intravenous artesunate from the Guilin company achieved WHO prequalification status in November 2010, which may facilitate its formal acceptance into standard drug formularies. In the UK, artesunate is accessed on a ‘named patient basis’ and is available via the two schools of tropical medicine (Liverpool and London).22 In the USA, the use of artesunate falls under an ‘investigational new drug’ protocol and it is only obtainable through the Centres for Disease Control and Prevention.19 In Australia, intravenous artesunate is widely available in hospitals through the national ‘Special Access Scheme’; a similar scheme has been established in Canada via the Canadian Malaria Network. The accessibility of intravenous artesunate in other countries varies widely. For the treatment of uncomplicated falciparum malaria, oral artemisinin-based combination therapies (ACTs) exhibit at least equal efficacy to non-artemisinin-based regimens for both adults and children,24 and have been the treatment of choice since the 2006 WHO treatment guidelines. Artemether plus lumefantrine (Coartem or Riamet) is the ACT most commonly used by global malaria eradication programmes and is widely distributed in under-resourced countries. However, Coartem/Riamet and other ACTs are not readily available in Canada, UK and parts of Europe, due to licensing and quality assurance issues similar to those encountered by intravenous artesunate. UK and Canadian national guidelines recommend atovaquone plus proguanil (Malarone) or quinine sulphate plus doxycycline/clindamycin as effective alternative treatment regimens21 ,22 (figure 1 and table 3). As a result, ACTs are increasingly used in all non-falciparum malaria, and are currently recommended by WHO as an alternative to chloroquine for chloroquine-sensitive species (figure 1 and table 3). In a Cochrane systematic review comparing the efficacy of ACTs versus chloroquine for chloroquine-sensitive vivax malaria in both children and adults, ACTs demonstrated lower rates of remaining parasitaemia at 24 h (3 trials, 1165 participants; RR, 0.39; 95% CI 0.31 to 0.48) and equivalent treatment efficacy as measured by recurrent parasitaemia before day 28 (4 trials, 1185 participants; RR, 1.0; 95% CI 0.8 to 3.39).27 In addition, ACTs with long half-lives (particularly dihydroartemisinin-piperaquine) were demonstrated as probably superior to chloroquine over 6–8 weeks follow-up, with significantly fewer recurrent episodes after day 28 (2 trials, 668 participants; RR, 0.47; 95% CI 0.29 to 0.76).27 Two other thorough literature reviews elaborate further on this evidence with an additional eight studies which had not been included in the systematic review.4 ,25 Lastly, one review examined specifically the efficacy of artemether-lumefantrine (the most widely available ACT) for vivax malaria,26 and summarised that lumefantrine's relatively short half-life translated to a lower day 28 parasitological cure rate compared with some other ACTs or chloroquine-primaquine when given alone, but had similar efficacy to chloroquine-primaquine when it was also given with primaquine. Unfortunately, resistance of falciparum malaria to artemisinins has started to emerge in areas along both the Thai-Cambodian and Thai-Myanmar borders, as seen by increasing parasitic clearance times and rising treatment failure rates.28 ,29 Day 42 treatment efficacy rates are now estimated to have decreased from nearly 100% to 75–90% in western Thailand,29 and the prevalence of impaired artemisinin efficacy may be as high as 30–40% in western Cambodia.28 ,29 Despite the introduction of ACTs a decade ago in Cambodia, monotherapy artemisinin use is the most common.28 As artemisinins are still the most effective compounds available in these areas, they are still considered the treatment of choice if coupled with a partner drug, while containment measures that limit the spread of resistant strains continue to be implemented. In children infected with P vivax, P ovale, or an infection (including mixed infection with more than one species) where P vivax or P ovale cannot be reliably excluded, a 14-day course of primaquine is necessary to eliminate hypnozoite forms dormant in the liver13 ,20–22 to prevent relapse months to years later. Screening for glucose-6-phosphate dehydrogenase (G6PD) deficiency should be performed prior to the administration of primaquine and advice sought from paediatric infectious disease specialists should the patient be G6PD deficient. For those without G6PD deficiency, the antihypnozoite primaquine dose varies with species; a dose of 0.25 mg/kg daily is adequate for P ovale infections, whereas 0.5 mg/kg daily is recommended in P vivax infections (or infection with unknown species) due to the increasing resistance to primaquine primarily in Southeast Asia (table 4). Patients with a mild variant of G6PD deficiency (see footnote of table 4 for G6PD variant classification) may be treated with a less-intensive and prolonged course of primaquine under close supervision of a paediatric infectious disease specialist, using a dose of 0.75 mg/kg weekly for 8 weeks.13 ,19 ,21 ,22 ,30 The patient should be monitored closely, and if signs of haemolysis occur (eg, jaundice, darkened urine) the medication should be stopped. Primaquine is the only antimalarial that is effective against all stages (including mature) gametocytes; artemisinins (and to a lesser extent sulfadoxine-pyrimethamine, amodiaquine and chloroquine) target only early-stage (but not mature) gametocytes.31 Therefore, although not suggested on a routine basis, for those patients living in areas at risk of ongoing malaria transmission, the administration of a single dose of primaquine (after checking G6PD status) should be considered for adults and children ≥1 year of age who are infected with P falciparum or P malariae (there is no evidence to date of human-to-human transmission of the zoonotic P knowlesi), in addition to the primary antimalarial therapy;13 ,31 primaquine therapy for liver hypnozoites will adequately treat gametocytes in those infected with P vivax, P ovale or an unknown species (see above). Previous guidelines for non-endemic countries suggest that all patients with falciparum malaria should be hospitalised for observation and initial treatment.20–22 However, routine admission may not always be necessary and most children in resource-poor countries are managed in the outpatient setting (often not even by a medical doctor). As stated previously, an increasing proportion of imported malaria cases are attributed to recent migrants/refugees and VFRs. These patients may have a degree of antimalarial immunity, conferring some protection from the more severe manifestations of disease. A recent systematic review summarises the results of five studies (four in adults, one in children) in which patients with uncomplicated falciparum malaria were successfully managed in an outpatient setting.32 Three studies involved only immigrant/refugee populations while two studies included travellers/expatriates with imported malaria. In all studies, approximately 40–75% (62% in the study involving children)33 of patients with falciparum malaria were successfully treated in the ambulatory setting. The selection criteria for outpatient management were similar: clinically well without clinical or laboratory features of severe malaria, low level of parasitaemia, and reliable follow-up and family support. 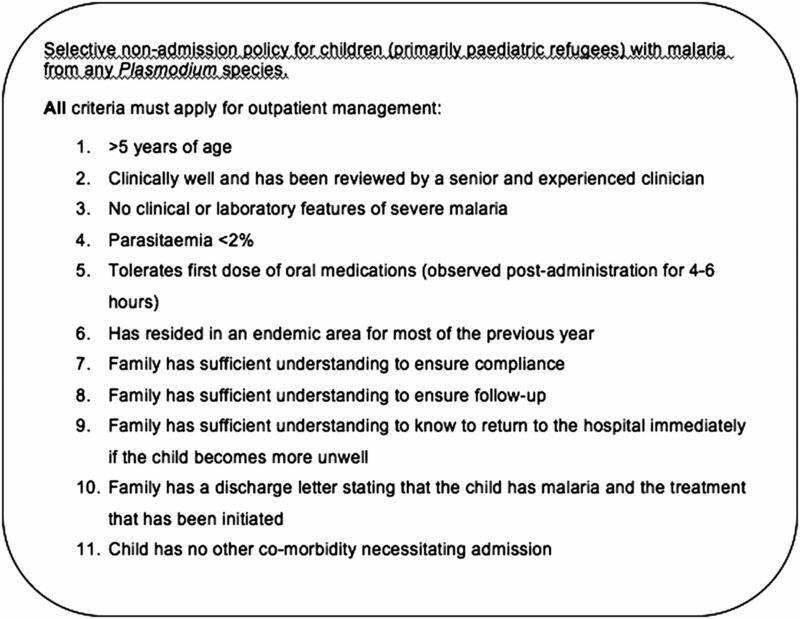 In children, Cherian and Burgner33 demonstrated that, by applying criteria similar to those listed in figure 2 to a group of 90 paediatric refugees with newly-diagnosed falciparum malaria, hospitalisation could be avoided in over 60% of cases. By extension, these criteria could probably be applied safely to children with non-falciparum malaria as well, although data are lacking. Although it is clinically well-known (and rightly feared) that young children, especially those <5 years of age, are at increased risk of rapid deterioration and death, this study provides some evidence that an increasing number of selected children, who are likely to have some antimalarial immunity, may be managed safely at home. Alternatively, these children may be managed by ‘hospital in the home’ programmes, if available. The decision to manage a child with malaria without hospital admission should be made by clinicians experienced in management of malaria, with consideration of likely antimalarial immunity and ‘safety net’ provisions should the child's condition deteriorate. If there is concern that patient safety will be compromised by outpatient treatment, the child should be admitted to hospital. In summary, the recommendations in this update reflect the current WHO malaria treatment guidelines and are tailored to the treatment of imported malaria in children in non-endemic countries. This update also reflects the divergence of treatment options between these countries, based on availability of ACTs. In light of the recent high-quality evidence around the effectiveness of artemisinins in children, the inclusion of intravenous artesunate and oral ACTs into the national protocols of non-endemic countries and their improved availability should be encouraged. Many thanks to Drs. Ric Price and Nick Anstey (Menzies School of Health Research, Global and Tropical Health Division, Darwin, Australia) for generously volunteering their knowledge and advice for this review.
. Plasmodium knowlesi malaria in children. Emerg Infect Dis 2011;17:814–20.
. The pathophysiology of vivax malaria. Trends Parasitol 2009;25:220–7.
. Understanding the clinical spectrum of complicated Plasmodium vivax malaria: a systematic review on the contributions of the Brazilian literature. 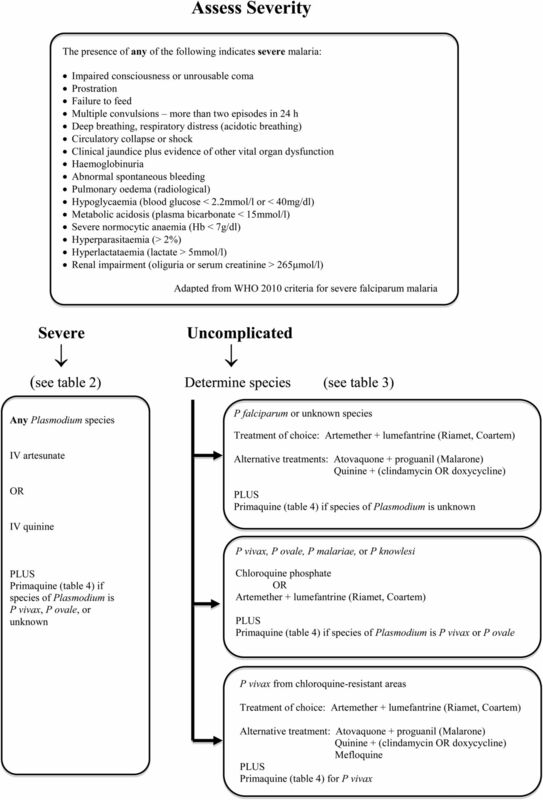 Malar J 2012;11:12.
. Plasmodium vivax treatments: what are we looking for? Curr Opin Infect Dis 2011;24:578–85.
. Vivax malaria: neglected and not benign. Am J Trop Med Hyg 2007;77(6 Suppl):79–87.
. Severe Plasmodium knowlesi malaria in a tertiary care hospital, Sabah, Malaysia. Emerg Infect Dis 2011;17:1248–55. World Health Organization. World malaria report 2011. Geneva: World Health Organization, December 2011.
. Malaria surveillance—United States, 2009. MMWR Surveill Summ 2011;60:1–15. Health Protection Services. Migrant health: infectious diseases in non-UK born populations in the United Kingdom. An update to the baseline report—2011. London: Health Protection Agency, 2011.
. UK treatment of malaria. Arch Dis Child Educ Pract Ed 2011;96:87–90. National Notifiable Diseases Surveillance System (database on the Internet). http://www9.health.gov.au/cda/Source/CDA-index.cfm (accessed 30 Nov 2011).
. Current status of the clinical development and implementation of paediatric artemisinin combination therapies in Sub-Saharan Africa. Wien Klin Wochenschr 2011;123(1 Suppl):7–9. World Health Organization. Guidelines for the treatment of malaria, 2nd edn. Geneva: World Health Organization, 2010.
. Comparative pharmacokinetics of intramuscular artesunate and artemether in patients with severe falciparum malaria. Antimicrob Agents Chemother 2004;48:4234–9.
. Review of the clinical pharmacokinetics of artesunate and its active metabolite dihydroartemisinin following intravenous, intramuscular, oral or rectal administration. Malar J 2011;10:263.
. Artesunate versus quinine for treatment of severe falciparum malaria: a randomised trial. Lancet 2005;366:717–25.
. Artesunate versus quinine in the treatment of severe falciparum malaria in African children (AQUAMAT): an open-label, randomised trial. Lancet 2010;376:1647–57.
. Artesunate versus quinine for treating severe malaria. Cochrane Database Syst Rev 2012;(6):CD005967. Centers for Disease Control and Prevention. Artesunate is available to treat severe malaria in the United States. Atlanta: Center for Disease Control and Prevention. http://www.cdc.gov/malaria/diagnosis_treatment/artesunate.html (accessed 11 Nov 2011). eTG complete. Melbourne: Therapeutic Guidelines Limited; 2010 (updated March 2010). (accessed 12 Oct 2011). Public Health Agency of Canada. Canadian recommendations for the prevention and treatment of malaria among international travellers—2009. Can Commun Dis Rep 2009;35(Suppl 1):1–82.
. UK malaria treatment guidelines. J Infect 2007;54:111–21.
. Therapeutic responses to different antimalarial drugs in vivax malaria. Antimicrob Agents Chemother 2000;44:1680–5.
. Artemisinin-based combination therapy for treating uncomplicated malaria. Cochrane Database Syst Rev 2009;(3):CD007483.
. Artemisinin combination therapy for vivax malaria. Lancet Infect Dis 2010;10:405–16.
. The use of artemether-lumefantrine for the treatment of uncomplicated Plasmodium vivax malaria. PLoS Negl Trop Dis 2011;5:e1325.
. Artemisinin-based combination therapy for treating uncomplicated Plasmodium vivax malaria. Cochrane Database Syst Rev 2011;	(7):CD008492.
. Artemisinin resistance in Plasmodium falciparum malaria. N Engl J Med 2009;361:455–67.
. Emergence of artemisinin-resistant malaria on the western border of Thailand: a longitudinal study. Lancet 2012;379:1960–6.
. Review: Improving the therapeutic index of 8-aminoquinolines by the use of drug combinations: review of the literature and proposal for future investigations. Am J Trop Med Hyg 2011;85:1010–14.
. The role of anti-malarial drugs in eliminating malaria. Malar J 2008;7(Suppl 1):S8.
. The case for outpatient treatment of Plasmodium falciparum malaria in a selected UK immigrant population. J Infect 2009;59:259–63.
. Selective ambulatory management of Plasmodium falciparum malaria in paediatric refugees. Arch Dis Child 2007;92:983–6. Contributors PB, DS, SL, AS, and DB provided intellectual input into the manuscript, and reviewed and approved the final draft.